Distressed skin is left hydrated and deeply nourished in just ten minutes with the First Aid Beauty Ultra Repair Instant Oatmeal Mask (56.7g). Ideal for use on all skin types (including sensitive skin), this luxurious oatmeal mask provides the perfect antidote to dry, damaged skin - its rich formula rehydrates and soothes skin, leaving it soft and supple. Combining a duo of protective oats that boast powerful botanical antioxidants and reparative skin-nourishing ingredients, this miracle mask from First Aid Beauty promises to calm, rehydrate and moisturise rough skin. It also works to combat free radicals, relieving irritation and inflammation to revive your complexion. *Free from parabens, harsh chemicals and colourants. Safe for use even on sensitive skin. 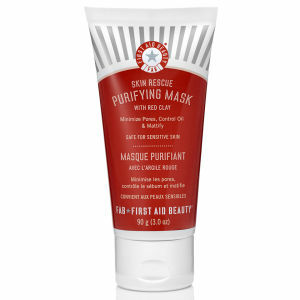 Apply a copious layer of First Aid Beauty Ultra Repair Instant Oatmeal Mask to your cleansed face. Wait for up to ten minutes before gently rinsing the product off. 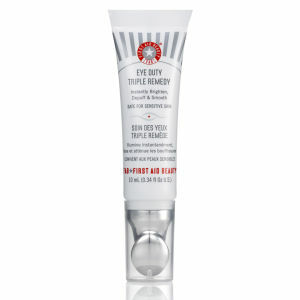 For best results, use two to three times weekly on dry or distressed skin. Wait ten minutes and rinse off. Use 2-3 times per week for dry or distressed skin. Water/Aqua/Eau, Glyceryl Stearate Citrate, Cetyl Alcohol, Glyceryl Stearate, Caprylic/Capric/Succinic Triglyceride, Caprylic/Capric/Myristic/Stearic Triglyceride, Avena Sativa (Oat) Bran, Colloidal Oatmeal, Butylene Glycol Dicaprylate/Dicaprate,Butyrospermum Parkii (Shea) Butter, Octyldodecanol, Glycerin, Polysorbate 20, Cetearyl Alcohol, Decyl Glucoside, Theobroma Cacao (Cocoa) Seed Butter, Polysorbate 60, Prunus Armeniaca (Apricot) Kernel Oil, Vanillin, Vanilla Planifolia Fruit Extract, Xanthan Gum, Dimethicone, Avena Sativa (Oat) Kernel Extract, Glycyrrhiza Glabra (Licorice) Root Extract, Camellia Sinensis Leaf Extract, Chrysanthemum Parthenium (Feverfew) Extract, Hippophae Rhamnoides Fruit Extract, Zingiber Officinale (Ginger) Root Extract, Butylene Glycol, Bisabolol, Hydroxyphenyl Propamidobenzoic Acid, Caprylyl Glycol, Pentylene Glycol,1,2-Hexanediol, Tetrasodium EDTA. I have to say, this is the first time FAB failed me. it just does nothing to me. It doesn't hydrate my skin, doesn't nourish it. And it's quite expensive in term of its size. 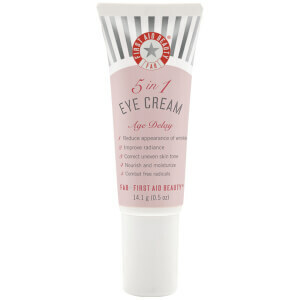 Maybe, it works wonders on those who have really sensitive skin and need good instant repair. Otherwise, I wouldn't reccommend it. Nice moisturising mask, gentle to skin, without any irritational feelings. I've tried better moisturising masks, but this one is much cheaper and good to sensitive skin. I bought this because I have heard of a lot of good comments on how this product does magic on their face. Although I did not see a huge difference after, it is a good moisturizing mask with a decent scent. 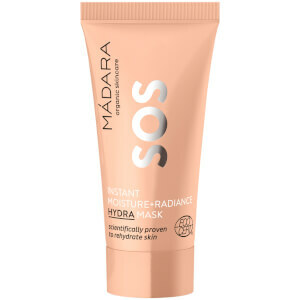 One of those basic masks you can use all the time! Great to hydrate the skin. Quite basic.